Doug Kern, one of the partners at Fisherman’s Landing Tackle in San Diego, is a very creative guy. Each year, he plans extensively for the Fred Hall Shows. His attention to detail is in keeping with his personality. Doug has a wealth of knowledge of everything “fishy.” He loves fishing; he knows how to fish and knows the details of all of the fishing products that we use in Southern California. If you want to know how to fish for anything within range of any of the boats out of San Diego — or around the world — Doug knows how to do it. Consequently, the employees of Fisherman’s Landing Tackle know how to do it, too. The relationship between the Fisherman’s Landing Tackle store and the San Diego fishing fleet is unique. The vast majority of the boats are affiliated with Fisherman’s Landing, and the information and the knowledge that passes from skippers to deck hands to anglers all ends up in the heads of the Fisherman’s Landing Tackle store employees. If you have a question, they have an answer. They also have the products that will make you a better angler. Fisherman’s Landing is like a high-end golf store. Golfers who take their game seriously would never buy just a standard set of clubs off the rack from a “big box” store. They go to specialty shops where the clubs are fitted for “lie,” loft, length and weight. They take into account your swing speed and the direction you swing the golf club. At Fisherman’s Landing Tackle store, they do the same thing for anglers. They do not sell fishing tackle “combos.” The professionals at Fisherman’s Landing will fit you for the proper rod and the proper reel for the bait you are using and the fish you are fishing for. They can help you cast farther with much less effort, catch more fish and generally make fishing more fun than it already is. 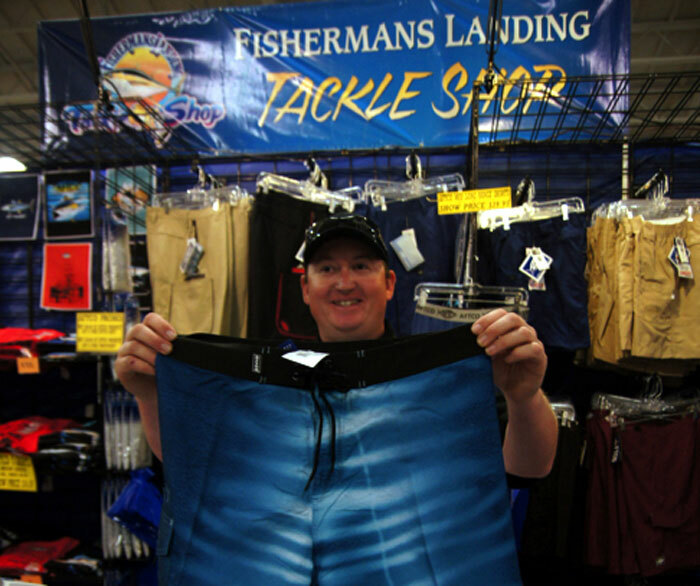 At the Fred Hall Del Mar Show, Fisherman’s Landing Tackle will have its traditional giant booth near the front entrance to the Exhibit Hall at the Del Mar Fairgrounds. It will be filled to the brim with great products and great deals. Fisherman’s Landing is a unique and very special tackle store. Doug Kern sets the tone with his honest, direct, no-nonsense approach to fishing and selling fishing tackle. He’s a guy you can trust to give you the best information and outfit you the proper way. Stop by and give Fisherman’s Landing a try!